The animals, from Madagascar, had been without water and food for at least five days, reports say. They are believed to have been destined for the exotic pet market in the US. The surviving animals have been taken to the Johannesburg Zoo, where they are said to be "stable". "A substantial number have stabilised, eating and drinking, there are about over 1,200 that have survived - others with irreparable damage," the zoo's veterinarian Brett Gardener told the BBC. Mr Gardener said while some losses can be expected when shipping animals over long distances, what possibly exacerbated this particular case was the delay to the connecting flight to the US. "The boxes arrived on Tuesday morning and were scheduled to connect on a flight that evening. The flight was delayed indefinitely due to bad weather and attempts to put them in another flight failed," he said. 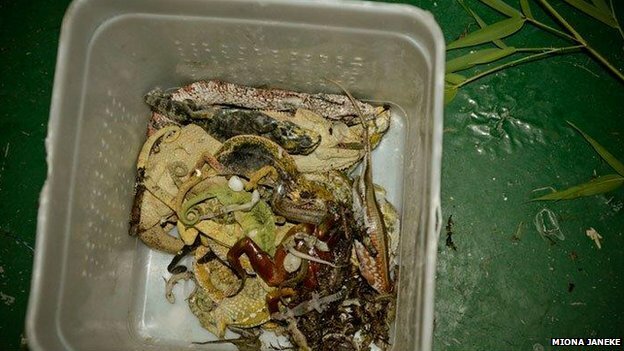 The animals were found on Wednesday after an inspector from the National Society for the Prevent of Cruelty to Animals (NSPCA) noticed "a bad smell" during a routine cargo inspection and found that some of the animals in the boxes had begun decomposing and some were barely alive. 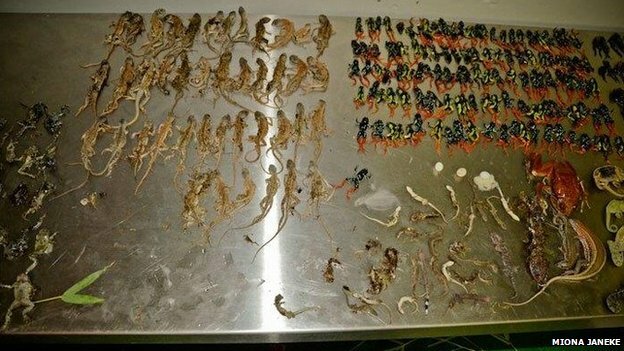 'Animal cruelty' The animals, which included at least 30 different species of frogs, chameleons, lizards and toads and geckos, had been placed in two crates about half a metre in size - one on top of the other. The chameleons were tied in small muslin bags, while the other reptiles and amphibians were crammed into small plastic tubs. 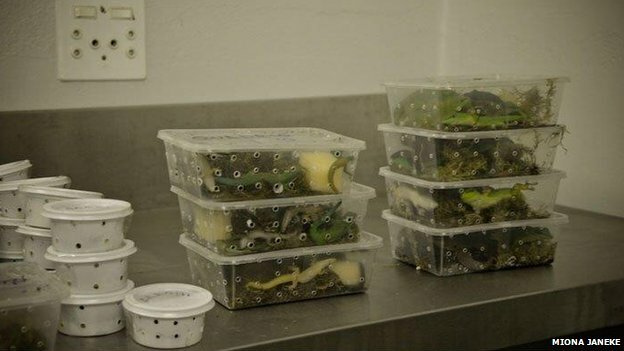 Some of the animals were so tightly packed together that they were unable to move or turn around, local media report. Many of the recovered animals were classified as endangered, vulnerable, or threatened, according to the Convention on the International Trade in Endangered Species (Cites). Those on Cites appendix II protocol, meaning that they can be traded, but only with a special permit. The Star newspaper reports that they did have the authorisation but local animal rights groups have called for an investigating into how the consignment came to arrive in South Africa. The NSPCA and the Department of Agriculture, Forestry and Fisheries are further investigating the matter. "The authorities suspect that there are South African agents involved [who work as middle men] and once investigations are finalised they would be charged with animal cruelty," said Ainsley Hay, head of the NSPCA's Wildlife Unit. The department will be contacting authorities from Madagascar to discuss what should be done with the animals, until then they will be treated in some zoos locally. Madagascar, the fourth largest island on the planet, is deemed one of the world's biological hotspots.